Game of Life is an old news, yes, but last Friday I stumbled to something special that forced me to relive the film once more. 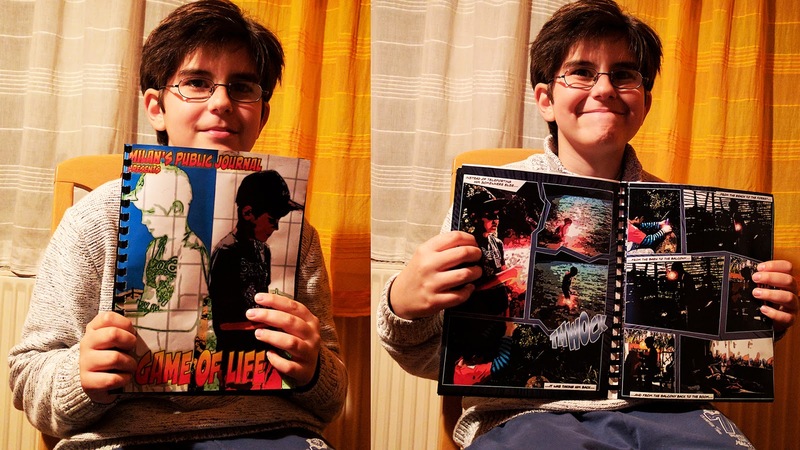 It was an extraordinary comic book creator called "Comic Life", made by plasq development company which gave me genuine pleasure last entire weekend. I was looking for a comic book related application before and even tried couple of them but they were all way below Comic Life and all the features it offers. I was immediately hooked by its nativity and simplicity and instantly thought about our short film. After very little hesitation I decided to give it a try and the result is sort of "Game of Life" made by "Comic (of) Life". After all, I had everything, the script, the video file and the free time last weekend and to create a comic book out of it was pretty straightforward. What I did was to open Game of Life in VLC player and to take couple of screenshots in order to import them into "Comic Life" and the rest is in this post. Well, soon after, couple of screenshots turned into dozens and dozens into exactly 195 images but it all was worth the effort. Actually it wasn't without little post processing but I enjoyed it all the way. Last night we went to laser print the first copy and here it is below in Viktor's hands and in following preview (it needs some time to load). If you have seen the film and liked it, and if you are a comic book fan like me, I am sure you will find it entertaining and visually, well I wouldn't say perfect, or even good, but for a first-timer effort pretty well. You can click on the preview to open a Game of Life PDF file in another tab and see it full screen or if you a perfectionist, below is a full resolution file with images in 300dpi you can download. I am surely still thrilled of how good it went out and especially for entire entertainment I had during making it, so for a moment I thought it was even better then the video itself. But today, like they say, the breakfast is always smarter then last day dinner, I am not so sure. They are two different media and not comparable per se. While the motion pictures contain that magical aspect of living the story and especially in this case hearing the glitch and effects, it lacks the narrative which is the main feature of one graphic novel. Nevertheless, following is the embedded film as well so if you have some comments, feedback or anything to say I would love to hear it. Or better to read it. The film script and now graphic novel(la), tells a story about a young boy who's following a glitch in the system, presented in real life as a firefly, through numerous portals to the place where he meets a man with the final orb, the artifact that seems to be a way in for full understanding of the life itself, its origin and the rules it is built on. Game of Life is only a first episode in the series and I called it "Flares and Fireflies" and perhaps just an introduction in the larger plot, which we hope we will continue making in the future. Finally, if you missed the story of how we made it, the script and all the funny moments, they are all in post Game of Life and Cyclops of Peloponnese and of course what inspired me to make the story is in simple question: Is Life a Zero-Player Game? and John Conway's original zero player game.